Randy Santel graduated with a Construction Management degree from Missouri State University in 2008 where he also played for 3 seasons as an offensive lineman on the Missouri State Bears football team. Before that, he grew up in St Louis, Missouri and graduated with honors from Duchesne High School in St Charles, Missouri. In 2010, he won the National Men’s Health / Spartacus Transformation Challenge and was flown to Auckland, New Zealand to appear in an episode of the TV series Spartacus. 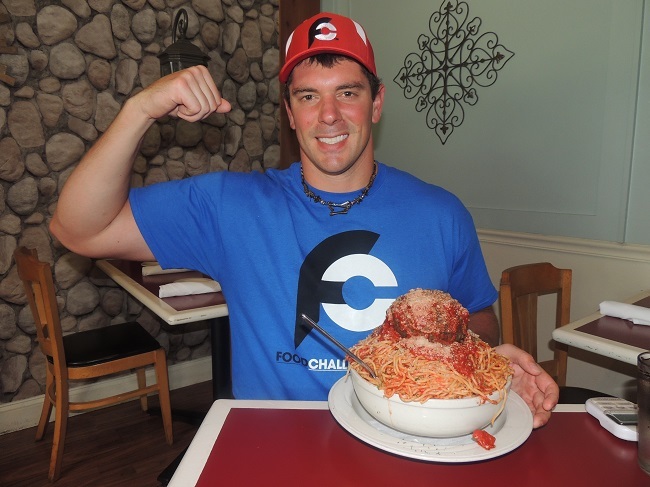 The week after completing the big transformation contest, he completed his very first food challenge on March 19th, 2010, which was The 28″ Pointersaurus Pizza Challenge in St. Louis, Missouri. He now has over 285 food challenge wins in over 22 states and 8 countries throughout the world. Randy is the chief content author and has written all of the articles available thus far.